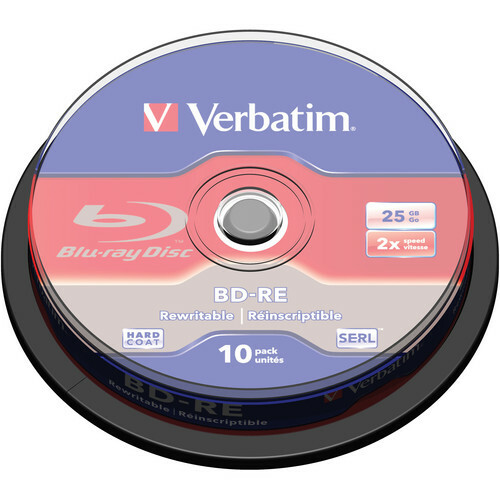 The Re-Writable Blu-ray Discs (25GB, 10-Pack) from Verbatim provide enough room to store large files such as long video recordings in full HD. The discs can record and be re-written to up to 1000 times. The discs feature HardCoat that resists scratches, dust, and fingerprints, ensuring your discs - and the data stored on them - last a long time. Box Dimensions (LxWxH) 5.45 x 5.45 x 1.2"
Re-Writable Blu-ray Discs (25GB, 10-Pack) is rated 4.8 out of 5 by 11. Rated 5 out of 5 by Bill from Verbatim Re-Writable Blu-ray Discs I back up 9GB DVDs to hard drives in .ISO format. These disks are great for repeatedly recreating the DVDs from the images for use without ever touching the original DVD discs. 10-pack is the perfect size because I usually only remake 4 at a time - should last for years this way. Rated 5 out of 5 by blujay from Great every time Have purchased these re-writable discs twice and they never disappoint. And the price at B&H is very good. You just have to be sure to look for these discs online because you won't often find them on the sales floor. Do your homework before you go to the store! Rated 4 out of 5 by Allen from Holds a lot but write speed is slow. Holds a lot of data. Much more than DVDs. Rewritable is a good thing. Can add to same disc as time goes by. Write speed is slow, but if you are not pressed for time, who cares. Hopefully they last. Rated 5 out of 5 by gene2usa2003 from Good disc I use these for archieving my data. Well packed and protected. After formatting hold about 22GB, quality disc, have a thicker feel to them. Works with my Panasonic blu-ray burner under Win 7 Pro 64. Rated 5 out of 5 by KevinG from Work Great! Great for developing a project. I would have been burning through a bunch of BD-R's with all the trial and error work. With these I can just erase and try again. Rated 5 out of 5 by Eugene from Re-writable blue-ray works great Write speed is only 2X but my burner will only do 2X so that is fine. If you have a faster burner you may want to get faster disk to match the burner. Rated 4 out of 5 by Donald M. from I like this product ,it works! Product works without any errors so far I burned a few disks without any problems. Rated 5 out of 5 by ears22 from Dependable Dependable product. Works great every time. Highly recommended. Can this be burned as bootable windows 10 cd?